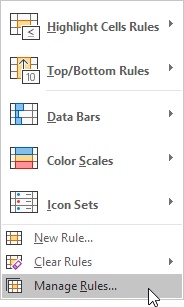 To view all conditional formatting rules in a workbook, use the Conditional Formatting Rules Manager. You can also use this screen to create, edit and delete rules. 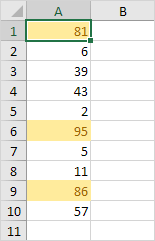 Note: because we selected cell A1, Excel shows the rule applied to the range A1:A10. 4. From the drop-down list, change Current Selection to This Worksheet, to view all conditional formatting rules in this worksheet. Note: click New Rule, Edit Rule and Delete Rule to create, edit and delete rules.